Osteomyelitis is a very serious medical condition characterized by inflammation of the bone and bone marrow that can be fatal if not properly treated. Osteomyelitis can be caused by bacterial or fungal infections. If caught early enough the condition is treatable with antibiotics and, in some cases, surgery. However, if left untreated -- often because of a misdiagnosis -- the infection may spread to other parts of the body or cause bone death. 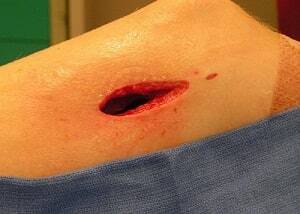 If bone death occurs, amputation may be the only option to prevent the spread of infection. If you have a potential osteomyelitis medical malpractice case in Maryland, call us at 800-553-8082 or get a free, confidential online consultation here. Osteomyelitis is caused by infectious organisms. These organisms can enter the body through several pathways. For instance, trauma that breaks the skins can introduce bacterial organisms into the body. A patient may contract osteomyelitis during orthopedic surgery, especially if the hardware is used to fix the fractured bone. Osteomyelitis may also occur if bacteria from major local infections such as cellulitis or necrotizing fasciitis enter the blood stream. Perhaps not surprisingly, one of the most common sources of osteomyelitis is staphylococcus aureus, a member of the normal flora found on the skin and mucous membrane. If the skin is broken, this organism has a direct pathway into the body. Once the bone is infected, leukocytes are attracted to the infected area. In an attempt to kill the infecting organisms, the leukocytes release enzymes that lyse the bone. Bones are highly vascular. As a result, pus from the immediate infection disrupts the blood flow to local vessels causing bone death. To reformulate the bone, the body may release osteoblasts. These cells create new bony structures that are very visible bone deformities on diagnostic tests such as x-rays. 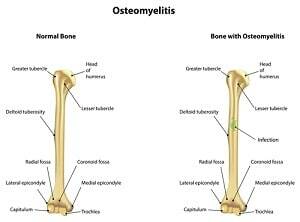 Osteomyelitis can be acute or chronic. This is also a classic way of distinguishing between chronic and acute osteomyelitis. Chronic osteomyelitis occurs when the osteomyelitis persists or recurs, despite aggressive intervention. With chronic osteomyelitis, there are commonly many bony deformities. Who is at high risk for contracting osteomyelitis? It is important to note that sometimes there are no direct signs of immediate infection. Osteomyelitis is commonly diagnosed by blood tests, diagnostic imaging, and bone biopsy. By far the most common way to diagnose osteomyelitis is through a CBC blood test. If an infection is occurring, the test will likely reveal an elevated White Blood Cell count (WBC). White Blood Cells are responsible for fighting off most infections in the body. Normal levels range from 4,500 – 10,000 white blood cells per microliter. Anything above this may indicate an infection is occurring. X-rays are a very powerful tool for diagnosing osteomyelitis. Generally speaking, it is cheaper to get an x-ray and nearly every healthcare facility has an x-ray machine nearby. Moreover, despite their limitations in revealing damage to soft tissue, x-rays are very good at visualizing bony structures. However, damage may not be visible until osteomyelitis has been present for several weeks. More expensive tests that can also be used to provide detailed images include Computerized Tomography (CT scans) and Magnetic Resonance Imaging (MRI). Both can provide exceptionally detailed images of the bone and the surrounding soft tissue. A bone biopsy can reveal what particular organism is causing the osteomyelitis and thus is an important tool for determining what antibiotics should be used for treatment. Osteomyelitis is usually treated with antibiotics and surgery. A typical course of treatment is IV antibiotics for several weeks. Hospitalization is usually required. If a large area of the bone has died or the infection has spread, surgery may be required to drain the infected area, remove diseased bone and tissue, and restore blood flow. As a last resort, a surgeon may amputate the infected area to stop the infection from spreading. When is the failure to diagnose or treat osteomyelitis medical malpractice? Medical malpractice typically occurs when a physician fails to recognize and respond to the signs and symptoms of osteomyelitis. On many occasions, the patient may be identified as high risk for osteomyelitis simply by taking a thorough history. Again, a patient with a recent history of trauma, infection, or orthopedic surgery is at high risk for developing osteomyelitis. Commonly, the patient presents with symptoms of severe pain, redness, and swelling in the location of the infection. Medical malpractice may occur if the physician fails to diagnose osteomyelitis by performing the appropriate diagnostic testing or fails to treat the condition by prescribing the appropriate antibiotics. Many times surgery may be avoided with the timely administration of IV antibiotics. Thus, it is essential for the physician to pay close attention to the patient's symptoms. Below are some sample verdicts and settlements in Maryland and from around the country in osteomyelitis cases. These are just examples of what a case involving the failure to diagnose and/or treat osteomyelitis might be worth. These verdicts are not representative of the outcome of each case. It is both trite and true: each case is different with unique facts and challenges. Virginia verdict: $570,494. The Plaintiff was a 12-year-old boy who suffered a comminuted left femur fracture while rollerblading. The defendant orthopedist improperly set the fracture causing misalignment and osteomyelitis. As a result, the boy required several additional operations. After deliberating for 2 hours, the jury returned a verdict for the Plaintiff for $570,494. 2006, Maryland settlement: $1,000,000. Plaintiff went to an orthopedist for a cervical laminectomy. Following the surgery, the Plaintiff returned to the orthopedist for treatment because the surgical incision was painful, red, and draining pus. The orthopedist cultured the fluid and found evidence of Staphylococcus areus. He prescribed an oral antibiotic. However, the Plaintiff did not get better. The infection spread and she eventually required additional surgeries including a total right hip replacement. Plaintiff contended the defendant orthopedist was negligent in failing to consult with an infectious disease specialist at the time of the culture and that he should have prescribed IV antibiotics. The case settled before trial for $1,000,000. 2004, Maryland settlement: $2,200,000. This is the tragic case of a 71-year-old man who was admitted to the hospital with severe back pain. He saw an orthopedist who diagnosed him discitis and prescribed pain medications. 17 days later the man was discharged. The man followed up with the same orthopedist on two additional occasions over the next several weeks complaining of severe back pain, neck pain, and feeling sensations of electrical shocks down both arms. Each time the orthopedist failed to diagnose the condition. A few days later, he presented to the hospital. Within hours, the man lost the ability to move his arms and legs. An MRI revealed he had been suffering from osteomyelitis. Due to the orthopedist's negligence in failing to diagnose and treat the condition, the man was permanently paralyzed. The case settled before trial for $2,200,000. 1990, Maryland settlement: $250,000. The Plaintiff fell from a ladder at work and fractured his ankle. Shortly after that, he saw an orthopedist who performed surgery but failed to prescribe antibiotics following the procedure. Six weeks after the operation, the Plaintiff developed an ulceration around his ankle. The Plaintiff developed osteomyelitis and required a below the knee amputation. The Plaintiff contended the orthopedist failed to administer prophylactic antibiotics at the time of surgery and failed to diagnosis osteomyelitis. The case settled shortly after the suit was filed. If you think you have a potential wrongful death malpractice claim for someone you loved because a doctor failed to diagnose an aneurysm, call 800-553-8082 or get a free no obligation case evaluation.